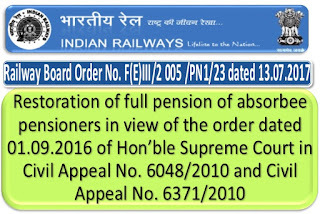 A copy of Department of Pension and Pensioners’ Welfare ( DOP&PW)’s O.M. No. 4/34/2002-P&PW(D) Vol.II dated 23rd June, 2017 on the above subject is enclosed for information and compliance. These instructions: shall apply mutatis mutandis on the Railways also. 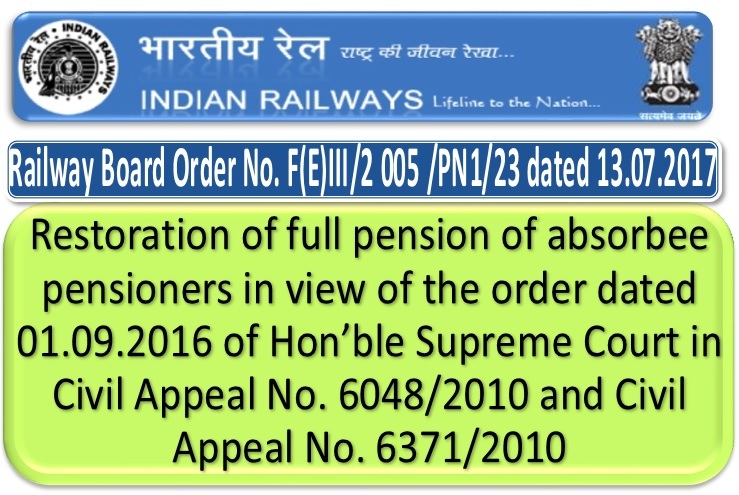 The erstwhile Rule 37-A of the Central Civil Services (Pension) Rules, 1972, which corresponds to Rule 54 of the Railway Services (Pension) Rules, 1993, stands omitted vide Board’s notification No. F(E)lIl/2003/PN1/25 dated 20.01.2005. Letter No. F(E)III/86/PN1/5 dated 16.04.1986. O.M. No. 4/30/2010-P&PW(D) dated 11.07.2013. Letter No. F(E)III/2005/PN1/23 dated 31.07.2013. O.M. No. 4/38/2008-P&PW(D) dated 04.08.2016. Letter No. F(E)III/2005/PN1/23 dated 10.08.2016.